Produced by the team at Migration and Asylum Project (MAP), a Delhi-based refugee law centre that works for forced migrants and refugees, it takes us through the different stages that asylum seekers encounter in search for a new life. As we enter House 808, there are sounds of children playing, women chatting and life as usual. There is a cot beside the bed, and books and photographs on the shelves, in remembrance of happier times. There is a television set and the evening tea is ready on the table. Someone was reading a magazine on the sofa with a pair of spectacles, while the woman of the house was clearly knitting. This is ‘Home’, and it feels like one. As we leave the house, we cannot help but notice the run down wall — probably preparing us for the arduous journey soon to follow. 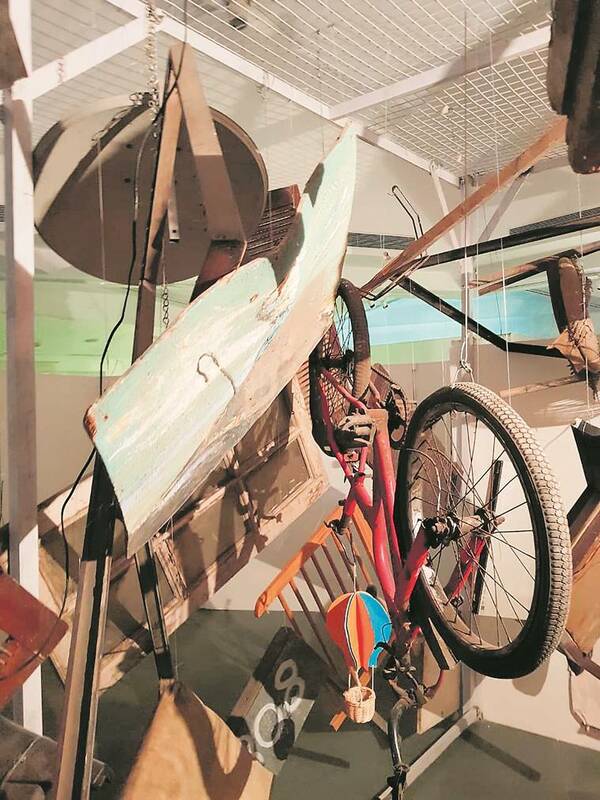 In the ‘The Exploded Room’, we see broken furniture, pots and pans, burnt notebooks, a rusty clock, a bicycle, and all things that make a home, suspended from the wall in a topsy-turvy manner. 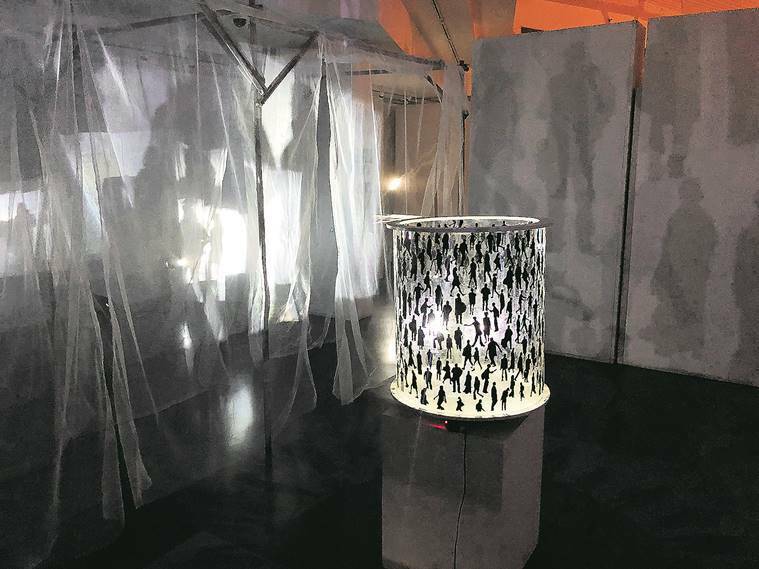 We are at “Passage to Asylum”, an immersive exhibition, at Delhi’s India International Centre, where soon we, like scores of refugees, travel to an alien country and face the asylum tribunal, which decides our fate. Produced by the team at Migration and Asylum Project (MAP), a Delhi-based refugee law centre that works for forced migrants and refugees, it takes us through the different stages that asylum seekers encounter in search for a new life. Maya Gupta, a Delhi-based architect, has designed the space, and the installations created by artist Kalyani Nedungadi enliven the experience. “The idea was to create installations not just for passive viewing, but an immersive experience. Through the exhibition, we get a glimpse of the ordeals of an asylum seeker,” says Nedungadi, who drew inspiration from accounts of real refugees and artists Cornelia Parker, Ibrahim Mahama, and El Anatsui, who engage with the subjects of chaos and upheaval. The show is a collaboration between MAP and University of York. A series of six contiguous installations or “rooms”, they symbolically depict the various stages of a refugee’s life — from a happy home, conflict and upheaval, in transit, entering an alien country, to facing an asylum tribunal. There are two prerequisites before one enters — getting the audio gear and picking up a refugee profile card. While the audio complements the mood of the installations, the card provides you with a refugee alter ego, which decides the course of your journey. We were a Syrian man, who is interrogated by the secret police and labelled a traitor, whose home is bombed. We’re fleeing to Lebanon. One can make multiple trips to the room with different cases each time. “We wanted to make it more personal and convey that grey area that even if you get asylum, things may not be perfect. That’s why we made the profile cards so that you can build your story as you walk through the space, and also generate some empathy,” says Nedungadi. The cases are based on stories of people the team has worked with and are varied in terms of countries, gender and age groups. With over 200,000 refugees, India provides shelter to a small population in the region. The group of lawyers at MAP have been offering legal assistance and representation to asylum seekers from countries such as Afghanistan, Somalia, Syria, and countries in Middle East in India, especially women and children, since 2013. The group helps asylum seekers from countries such as Afghanistan, Somalia, Syria, and countries in Middle East. “When people talk of humanitarian assistance to refugees, they stop at basic necessities, they do not realise how critical legal identity is to asylum seekers. We thought artvocacy is a apt way, than panel discussions and conferences to convey how traumatic the experience is and why lawyers are important,” says Roshni Shankar, who runs the centre. They are also running a livelihood initiative with Dastkar for Afghani refugee women, who are using their skills in traditional embroidery. Their store Atiqa will be launched next month. At the exhibition, we see familiar items strewn around in the next room. We are now in transit, where we enter a maze. “We wanted to create a maze to show that people leave not knowing if they will reach the other side or not. There is hope that you will reach somewhere and rebuild a life, but a wrong turn can take one anywhere,” says Nedungadi. The fourth room is different. There are white net curtains that we walk past and there are shadows people walking all around, but there is no one around. This is ‘Alien Country’. “When a person enters a new place, he can feel alone. It’s a new culture and language,” says Nedungadi.